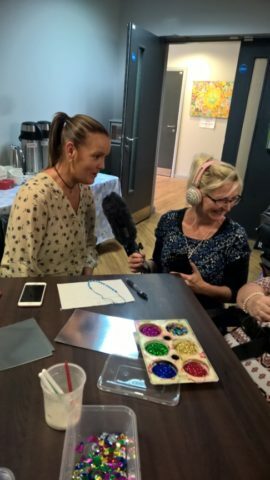 The third of three workshops – The Happy Monday’s Group, held at Inspire Centre Levenshulme Manchester. This workshop was the last of three before we run a showcase for each group in October. On Monday 24th July we wondered with anticipation what the Happy Monday group would bring and share. Would we discover a common theme with this workshop and the other two? 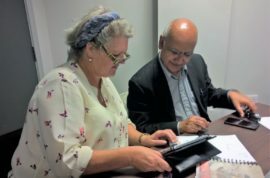 Both Rachel and I have worked independently with the Happy Monday group before, we knew they were going to be a lively jokey over 50’s group and usually very vocal. For myself the workshop brought a first time up close and personal experience of the strength and power smell has on the senses! It rather took me by surprise. 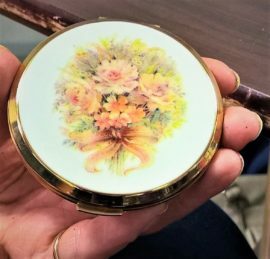 Among the many stories shared one woman Janet, who had brought her Mothers face powder compact, explained it was treasured as when she opened the compact the smell reminded her of her Mum. While listening I had a quick sniff and POW there was my grandma almost with me, a very strong sensation of her presence, brought tears to my eyes. It was totally unexpected but also very nice to be strongly reminded of my grandmother. This was a similar experience for some of the others in the room, one woman explained how her mother’s compact, also precious to her, had unfortunately become buried treasure by a grandchild and once dug up, smelled of earth. (For those in the group, if I have miss remembered the details, please do let me know) Another women told of the special talc belonging to her Mum, which she had kept and periodically used, reminding her of her Mum, and wishing it had not eventually run out. The group is an over 50’s group with the average being 60+. A lot of the people who came talked of stories and memories of loved ones and brought treasures that held those memories close and dear. 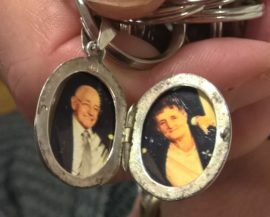 A Locket holding precious memories. The powerful powder smell from a compact bringing up memories. Rachel, Sam and Christopher (helping out on the workshop) recorded the stories, and having listened to them all now, they are very moving. People have been brave to share them so honestly with us. Before Rachel and I run this workshop we had wondered would there be a common theme between all three groups. There did appear to be one between the first two groups, which was despite their different situations, was a strong resilience to continue through tough difficulties, with a large dose of living in the moment and having a joke and a laugh. It seems that this very much applies to the Happy Monday’s having to deal with sad life changes when they lost loved ones, developing strategies to continue with life whilst remembering those they had lost. And without a doubt having a shared laugh and jokes, over cups of tea, coffee and biscuits!